This post is part three of a three-part series on branding bots. 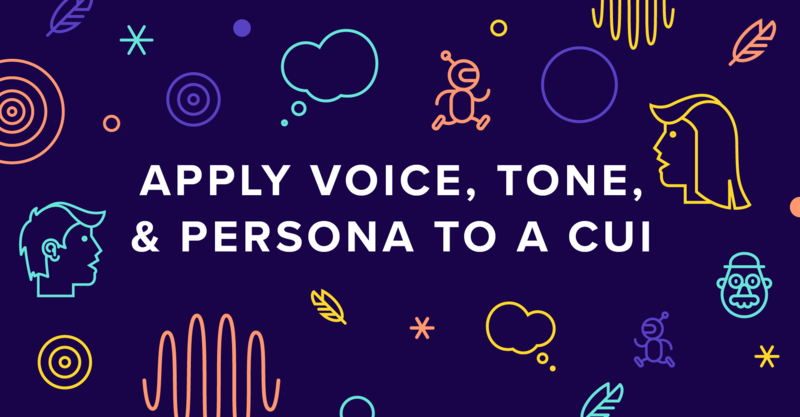 Read part one on voice and tone and part two on brand personas. 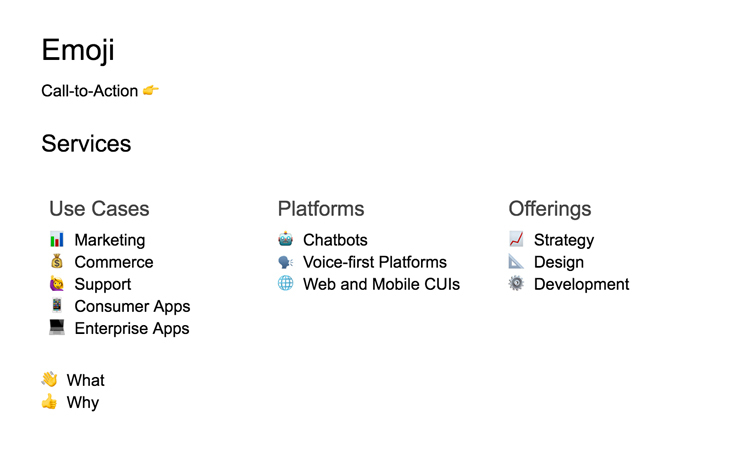 In this final edition, we’re going to bring it all together and talk about applying these concepts to designing a conversational user interface (CUI). Understanding users makes your CUI better at talking with them. Developing a brand relies on having an understanding of your audience’s values, needs, and desires. Conversational interfaces foster a more intimate interaction with users that our typical screen-based interfaces. Because of this intimate relationship, they require a deep understanding of users’ expectations. There are numerous ways to uncover insights about users that will guide branding, but I’m going to cover a couple Voxable’s favorite methods. Our go-to research method for better understanding users is to talk with them in the environment where they would be interacting with the interface. Through user interviews, we focus on understanding the Jobs-to-be-Done as well as gather insights about users’ values, concerns, and the language they use. Pairing user interviews with a competitive brand analysis lays the foundation for the brand direction. Brand affects nearly every part of a business and evolves as the business matures. We focus on brand throughout the entire design process, not just at the beginning. We usually incorporate branding questions while testing prototypes as well as in interviews with subjects participating in a Wizard-of-Oz usability test. These are both incredibly valuable methods for observing the interactions users have with a conversational interface – how they perceive and understand the language the interface uses. Document a voice and tone style guide. Qualities of the Brand Voice Describes the characteristics of the brand and conversational voice. We work with stakeholders and users to determine these qualities. Is the brand young and hip? Authoritative? Sarcastic? Key Terms Defines how terms should be used consistently in the language. Emoji Dictates which concepts core to our brand we using emoji to express. Grammar and Usage Establishes how to use punctuation, capitalization, and symbols like the ampersand in textual interfaces. Knowing the moments to define is all about understanding your users’ experiences and how language affects them in the interface. The guide becomes indispensable the more a CUI is iterated upon and it helps teams more effectively collaborate to keep the experience consistent. Documentation of emoji use in a chatbot style guide. Invest in creating a persona or character. Building characters is fun and challenging, and they can be an effective way to express your brand in a conversation. Characters help create a story and build empathy with users. The user journeys Voxable establishes in the research phase serve as a sort of plot device for the character. Thinking about how your character responds and evolves as users interact with it creates a more impactful story. Some of these characteristics may not make sense for every brand, so we incorporate different ones depending on the direction. Check out the Dungeons and Dragons character template for inspiration for describing characters. As I’m establishing the qualities of a character, I also pull inspiration for illustration direction on sites like Dribbble, Designspiration, Motionographer, and Pixar; this helps me provide direction to an animator or illustrator. Great animators and illustrators are fantastic resources when building a brand character. They are trained in visualizing stories and bringing characters to life. 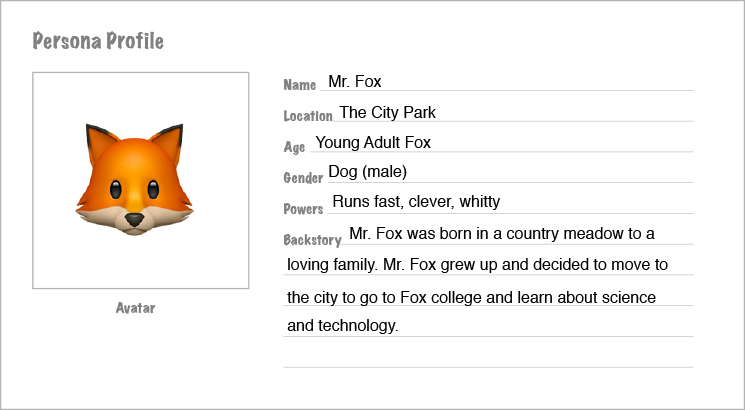 Example sketch of a character profile. Once I’ve established voice, tone, and (possibly) persona, I extend the defined brand to the aural and/or visual elements of the interface. Audio signatures, also called earcons, are tones or audio clips that are designed to represent a brand. Think of NBC’s chimes or HBO’s TV static. These signatures ground users in a brand and build brand recognition in the aural space. Sound effects and music clips can further express a brand in conversational interfaces. Through The Magic Door is an interesting storytelling game that beautifully integrates sounds effects, narration, and synthesized speech to create a branded audio experience. Conversational interfaces that include visual elements on a screen, like chatbots or GUI voice control, also have a whole range of visual elements to represents a brand. Animated GIFs, emoji, images, and video visually enrich conversational interfaces and are an effective way to convey brand if used correctly. I appreciate conversational interfaces because they provide such a rich and interesting space to create brand and product experiences. There is so much opportunity to build a deeper connection with users through compelling, well-crafted brand experiences.